There was one basic goal in the operation of Makronissos camp from the very beginning: the rehabilitation or reform of soldiers and citizens in order to be returned as “healthy” elements to the national body. In this framework, the role of propaganda, which was methodically applied in tandem with torture as part of a plan of psychological warfare against communists, was crucial. The content of the “reformatory” propaganda was aligned with the basic directions of the broader anticommunist discourse of the period (communism as deceit, illness and foreign threat), with emphasis on Makronissos as the great “school” and “healing center”. Vasilis Karabatsos, Makronisi. I triti apostoli, χ.ε., Athens 1995, p. 17. 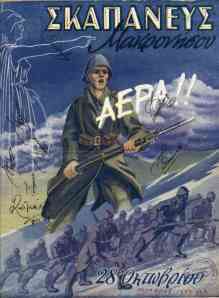 Stratēs Mpournazos, «“To µega ethnikon scholeion Makronēsou”, 1947-1950», sto Istoriko topio kai istorikē mnēmē. To paradeigµa tēs Makronēsou, Philistōr, Athēna 2000, s. 115-145.